The Finest Hours is a 2016 American historical drama-thriller film directed by Craig Gillespie and produced by Walt Disney Pictures. The screenplay, written by Eric Johnson, Scott Silver, and Paul Tamasy, is based on The Finest Hours: The True Story of the U.S. Coast Guard's Most Daring Sea Rescue by Michael J. Tougias and Casey Sherman. The film stars Chris Pine, Casey Affleck, Ben Foster, Holliday Grainger, John Ortiz, and Eric Bana, and chronicles the historic 1952 United States Coast Guard rescue of the crew of SS Pendleton, after the ship split apart during a nor'easter off the New England coast. The Finest Hours was released in the Disney Digital 3-D, RealD 3D, and IMAX 3D formats on January 29, 2016. The film received mixed to positive reviews from critics and was a box office flop, grossing just $52 million against its $70–80 million production budget. Bernard "Bernie" Webber, a crewman at the Coast Guard station in Chatham, Massachusetts, on Cape Cod, has fallen in love with a local girl, Miriam Pentinen. The two plan to marry on April 16, but in accordance with Coast Guard regulations, Bernie must seek permission from the station's commander, Daniel Cluff. On the day he is due to ask permission, February 18, 1952, the oil tanker SS Pendleton shears in half off the Chatham coast after getting caught in a nor'easter. With the majority of the station's crew already underway with the rescue of the similarly damaged SS Fort Mercer, Bernie is dispatched to pilot motor lifeboat CG 36500 to rescue the crew of Pendleton. Andrew Fitzgerald, Ervin Maske, and Richard P. Livesey volunteer to join Bernie on the rescue mission. Meanwhile, the Pendleton's engineer, Ray Sybert, as the surviving senior officer, organizes the surviving seamen to steer the sinking stern of the tanker onto a submerged reef, where it can lodge until rescuers arrive. When Miriam hears that Bernie is leading the rescue effort, she, like a number of townspeople, thinks this is a suicide mission. Few people in Chatham trust Cluff, since he is not from the area and does not know its treacherous weather. Miriam drives to the station, demanding that Cluff call Bernie back. Cluff refuses, and brusquely orders Miriam out. Between Chatham Harbor and the open sea lies a bar, a series of shoals that are very dangerous even in good weather. Bernie must time bursts of his engine to ride each approaching wave before it breaks as he pilots CG 36500 across the bar. Although he makes it over the bar, he loses his compass. Bernie steers CG 36500 to the stricken tanker. Although his boat's designated capacity is only 12 people, Bernie manages to rescue 32 crewmen. The stern of Pendleton begins sinking more rapidly during the rescue and goes down shortly after the last crewman comes aboard Bernie's boat. Relying on his knowledge of the coast and prevailing winds in place of his compass, Bernie steers CG 36500 toward home—a task made more difficult as Chatham loses power. Miriam and the other townspeople drive their cars to the pier and turn on their headlights to guide Bernie in. The film shows photographs from the event that briefly document the aftermath of the rescue. Two months later, Bernie and Miriam marry; they stay together for 58 years until Bernie's death in 2009. Webber and his crew receive the Gold Lifesaving Medal. Walt Disney Pictures acquired the screen rights to Michael Tougias' 2009 book, The Finest Hours: The True Story of a Heroic Sea Rescue in August 2011. Paul Tamasy and Eric Johnson wrote the script based on the book and interviews they conducted with survivors. In May 2013, Robert Schwentke was hired to direct the film. However, Schwentke left the project to direct The Divergent Series: Insurgent, and was replaced with Craig Gillespie in April 2014. Casting was done from April through October 2014. Principal photography began on September 8, 2014, in Quincy, Massachusetts. On October 27, the film was being shot at Fore River Shipyard in Quincy aboard USS Salem. They were also set to film at various South Shore locations and then move to Chatham, Massachusetts in December. In early December, filming was taking place in the town of Marshfield. Affleck was seen playing piano at Symphony Hall in Boston on December 12, during the Chatham shoot, and expressed to the Boston Globe that his experience shooting the film was "one of [his] best". Production designer Michael Corenblith reproduced the interior of Pendleton. Post-production lasted a year, with the film requiring nearly 1,000 visual effects shots. Moving Picture Company (MPC) was responsible for creating the majority of those shots. 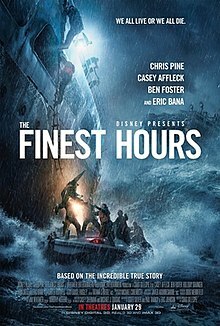 Walt Disney Studios Motion Pictures originally set The Finest Hours for release on April 15, 2016 and then October 9, 2015, until announcing a final release date of January 29, 2016. The first trailer for the film was released on July 8, 2015. A second trailer was released on November 11, 2015. The Finest Hours opened the Coronado Island Film Festival on January 15, 2016. The film held its world premiere at the TCL Chinese Theatre in Hollywood, California on January 25, 2016. Walt Disney Studios Home Entertainment released the film on Blu-ray, DVD, and digital download on May 24, 2016. The Finest Hours grossed $27.6 million in North America and $24.5 million in other territories for a worldwide total of $52.1 million. The film was released in North America on January 29, 2016, alongside Kung Fu Panda 3, Fifty Shades of Black, and Jane Got a Gun. The film was projected to gross $10–13 million from 3,143 theaters in its opening weekend. The film grossed $375,000 from its Thursday night previews and $3.3 million on its first day. It went on to gross $10.3 million in its opening weekend, finishing 4th at the box office. In March 2016, Variety reported Disney was expecting losses of around $75 million from the film. The Finest Hours received mixed to positive reviews from critics. On Rotten Tomatoes, the film has an approval rating of 64% based on 183 reviews, with an average rating of 6/10. The site's consensus states, "Old-fashioned to a fault, The Finest Hours will satisfy those seeking a traditional rescue drama – but may leave more adventurous viewers wanting more." On Metacritic, the film has a score of 58 out of 100, based on 39 critics, indicating "mixed or average reviews". On CinemaScore, audiences gave the film an average grade of "A–" on an A+ to F scale. All music composed by Carter Burwell, except as noted.. Conducted by Carter Burwell. Performed by the Hollywood Studio Symphony. Portions of Carter Burwell's score were replaced with music composed by Philip Klein, who had served as arranger on Burwell's score. Burwell chose to include two of Klein's tracks on the album. The album also includes five tracks that Burwell recorded, but which were replaced in the finished film. ^ "THE FINEST HOURS [2D] (12A)". British Board of Film Classification. January 18, 2016. Retrieved January 18, 2016. ^ FilmL.A. (May 2017). "2016 Feature Film Study" (PDF). FilmL.A. Feature Film Study. Retrieved May 3, 2018. ^ a b McGrath, Charles (January 7, 2016). "'The Finest Hours' Relives a Perilous, Forgotten Rescue". The New York Times. Retrieved January 10, 2016. ^ a b "The Finest Hours (2016)". Box Office Mojo. Retrieved May 1, 2016. ^ Tougias, Michael J. & Casey Sherman: "The Finer Hour: The True Story of the U.S. Coast Guard's Most Daring Sea Rescue"
^ a b c Fleming Jr, Mike (August 12, 2011). "Disney Acquires Coast Guard Rescue Saga 'The Finest Hours'". Deadline Hollywood. Retrieved September 12, 2014. ^ Dan Lamothe (July 13, 2015). "The real-life story behind Disney's forthcoming Coast Guard rescue movie, 'The Finest Hours'". The Washington Post. Archived from the original on July 22, 2015. The daring rescue of those mariners is the subject of a forthcoming Disney movie, 'The Finest Hours.' The first trailer for the film was released last week, underscoring the bravery of the Coast Guardsmen involved in the Feb. 18, 1952, recovery. ^ a b Cunnigham, Todd (April 9, 2015). "Chris Pine Thriller 'The Finest Hours' Pushed to 2016 by Disney". TheWrap. Retrieved April 9, 2015. ^ a b c Kit, Borys (April 17, 2014). "Chris Pine in Talks to Star in Disney Coast Guard Drama". The Hollywood Reporter. Retrieved September 12, 2014. ^ a b Fleming, Mike, Jr. (August 6, 2014). "Casey Affleck In 'Finest Hours' Talks". Deadline Hollywood. Retrieved August 7, 2014. ^ a b c Kroll, Justin (September 15, 2014). "Ben Foster Joins Chris Pine in Disney's 'Finest Hours' (EXCLUSIVE)". Variety. Retrieved September 22, 2014. ^ a b D'Alessandro, Anthony (October 2, 2014). "Eric Bana Cast In 'The Finest Hours', Disney's Sea-Rescue Pic". Deadline Hollywood. Retrieved October 3, 2014. ^ a b Yamato, Jen (August 26, 2014). "'The Finest Hours' Adds 'Outlander's Graham McTavish". Deadline Hollywood. Retrieved September 12, 2014. ^ a b Yamato, Jen (September 9, 2014). "Kyle Gallner Joins Disaster-At-Sea Drama 'The Finest Hours'". Deadline Hollywood. Retrieved September 12, 2014. ^ a b c d e "'Mother's Day' Adds Paul Wesley; More Join Disney's 'The Finest Hours'". Deadline Hollywood. September 25, 2014. Retrieved September 27, 2014. ^ a b c d e "The Finest Hours: Press Kit" (PDF). wdsmediafile.com. The Walt Disney Studios. Retrieved January 30, 2016. ^ a b Kroll, Justin (August 25, 2014). "'Dark Knight Rises' Actor Josh Stewart Joins Chris Pine in 'Finest Hours'". Variety. Retrieved September 12, 2014. ^ Zakarin, Jordan (September 9, 2014). "Disney Sets Sail on Chris Pine Coast Guard Drama 'The Finest Hours'". TheWrap. Retrieved September 12, 2014. ^ Graser, Marc; Kroll, Justin (September 20, 2012). "Tim Van Patten eyes 'Finest Hours'". Variety. Retrieved September 12, 2014. ^ Han, Angie (May 29, 2013). "'Red' Director Robert Schwentke to Helm Disney's 'The Finest Hours'". /Film. Retrieved September 25, 2014. ^ Gettell, Oliver (September 9, 2014). "Chris Pine Coast Guard thriller 'The Finest Hours' shoving off". Los Angeles Times. Retrieved September 13, 2014. ^ Leggett, Doreen (October 3, 2014). "Disney filming scenes for 'The Finest Hours' in Chatham". wickedlocal.com. Retrieved October 30, 2014. ^ "Wednesday, Dec. 3 Filming Locations for Forever, Madam Secretary, Sleepy Hollow, Empire, House of Lies, NCIS L.A., Hail Caesar!, Paper Towns, & more!". On Location Vacations. December 3, 2014. Retrieved December 3, 2014. ^ a b "'Finest Hours' is the finest shoot for Casey Affleck". The Boston Globe. December 12, 2014. Retrieved December 13, 2014. ^ Turan, Kenneth (January 28, 2016). "'The Finest Hours' stares down the fiercest of storms without blinking". Los Angeles Times. Retrieved January 30, 2016. ^ Milligan, Mercedes (February 25, 2016). "PC Whips Up Stormy Seas for 'The Finest Hours'". Animation Magazine. Retrieved March 11, 2016. ^ McNary, Dave (January 13, 2015). "Disney Sets Several 2016 Release Dates". Variety. Retrieved January 14, 2015. ^ Petski, Denise (July 8, 2015). "'The Finest Hours' Trailer: Chris Pine At The Helm Of Harrowing Rescue Mission". Deadline Hollywood. Retrieved July 8, 2015. ^ McNary, Dave (November 11, 2015). "Watch: Chris Pine Braves the Waves in 'Finest Hours' Trailer". Variety. Retrieved November 13, 2015. ^ Galuppo, Mia (December 15, 2015). "Coronado Island Film Festival Unveils Opening, Closing Night Screenings". The Hollywood Reporter. Retrieved December 16, 2015. ^ Emery, Debbie (January 25, 2016). "Chris Pine, Casey Affleck, Eric Bana Honor US Coast Guard at 'Finest Hours' Premiere". The Wrap. Retrieved January 28, 2016. ^ "'Kung Fu Panda 3' Will Dig Box Office Out Of The Snow With $40M+ Opening – Preview". deadline.com. ^ McClintock, Pamela (January 29, 2016). "Box Office: 'Kung Fu Panda 3' Trouncing Competition on Friday for $45M Debut". The Hollywood Reporter. Retrieved January 30, 2016. ^ McNary, Dave (January 29, 2016). "Box Office: Chris Pine's 'Finest Hours' Opens to Choppy $375,000 on Thursday". Variety. Retrieved January 30, 2016. ^ a b "'Kung Fu Panda 3' Kicking Up $13M Friday & $44M-$45M Opening Weekend". deadline.com. ^ Rainey, James (March 8, 2016). "Disney Expects $75 Million Loss on 'The Finest Hours'". Variety. Retrieved March 8, 2016. ^ "The Finest Hours (2016)". Rotten Tomatoes. Retrieved January 3, 2019. ^ "The Finest Hours". Metacritic. Retrieved February 15, 2016. ^ "Walt Disney Records Set To Release 'The Finest Hours' Original Motion Picture Soundtrack" (Press release). PR Newswire. Burbank, California. January 28, 2016. Retrieved January 30, 2016. ^ a b c d e f Simons, Pete (May 22, 2016). "The Finest Hours (Carter Burwell)". Retrieved November 11, 2017. ^ a b "The Finest Hours (Original Motion Picture Soundtrack) by Carter Burwell on Apple Music". Itunes.apple.com. January 29, 2016. Retrieved December 23, 2017. ^ Burwell, Carter. "Carter Burwell — The Finest Hours". Retrieved November 11, 2017. Barbo, Theresa Mitchell; Webster, W. Russell (2010). The Pendleton Disaster off Cape Cod: The Greatest Small Boat Rescue in Coast Guard History (2015 ed.). Charleston, South Carolina: The History Press. ISBN 978-1-60949-050-8. Tougias, Michael J.; Sherman, Casey (2009). The Finest Hours: The True Story of the U.S. Coast Guard's Most Daring Sea Rescue. New York: Scribner. ISBN 978-1-4165-6721-9. "Bernard C. Webber, USCG 1928–2009". United States Coast Guard. July 14, 2015. Retrieved July 12, 2015. The Daring Coast Guard Rescue of the Pendleton Crew. The History Press. September 24, 2013. This page was last edited on 21 April 2019, at 09:53 (UTC).